AW: What was your first reaction to your son(s) diagnosis? HS: My oldest son is diagnosed with many things, the first of which was Sensory Processing Disorder at age 4. My reaction to that diagnosis was a sense of relief. I knew something was going on – something we wrote off as being part of his transition into our home from foster care originally, but after over two years we knew it was more than that. Getting the actual diagnosis of SPD, the official stamp of ‘you’re not crazy there really is something going on here!’ gave us a focus, a path to begin to help him, and we were eager to start. Each diagnosis after that first one, Autism, Bipolar and multiple LDs, brought on another sense of relief, but also brought a large sense of worry, concern for his future, and a grieving process for me and my family as we were forced into acknowledging the true root of my son’s challenges and the gravity of their prognosis. AW: What was your defining moment of acceptance? HS: Acceptance for me has not come in a defining moment. It comes through the grief process, a process that is as unavoidable as it is necessary. I led the crusade for my son’s diagnosis – for information, for understanding and to get us on the ‘right’ path to help him. For me that meant that each time we got a new diagnosis, it was one I was expecting and actively seeking – one I knew was correct before we even entered the doctor’s office. Yet, until the doctor(s) agreed with me and sealed the diagnosis with their signature, I wasn’t forced to deal with that new diagnosis emotionally. To be honest, although I feel I have accepted many things about my son’s diagnosis including being comfortable with sharing and discussing his acronyms, I am still coming to terms each day with what they really mean in a practical sense. Kids grow up, even kids with special needs. Each day, month, year, I have new things to accept – both positive and negative – and find that I return to the grieving process for each of those pieces regularly. And it is each time I grieve something new, that my acceptance grows by another small layer. AW: What inspired you to start your blog? Your book? HS: My blog began as a way for me to share the same stories I was telling at our SPD Parent Connections Support Group meetings in person on weekends, in a format that people could access any time they wanted. Through these meetings, and the sharing of information and resources, I realized that the most valuable part of that interaction was the storytelling. It was the most powerful thing for me and for all of those attending, to hear that we were not alone – that each person in the room had a child that hated seams, screamed at loud noises, lined up cars, melted down during family functions and had been kicked out of preschool. Ok, maybe each person didn’t have all of those – but the common thread was that people could relate to each other’s lives. That is an incredible feeling. My blog aimed to provide that message, and now with the launch of the SPD Blogger Network, I am able to reach more families affected by sensory issues and provide a forum for more storytelling. That has led to the opportunity to write a new book, Sensational Journeys (Future Horizons September 2011), which is a collection of 48 personal stories from families raising children with Sensory Processing Disorder. My hope is that this book will give a broad look at how sensory issues affect a diverse group of families and truly bring home the message that these families are NOT alone! 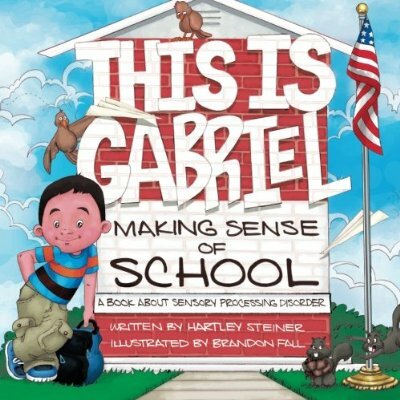 My Children’s book This is Gabriel Making Sense of School was inspired by a problem at my son Gabriel’s school when he was in first grade. One afternoon, just as my son should’ve been getting on the bus, I received a phone call that I needed to pick him up. He had a particularly bad meltdown at school, so with my toddler on my hip and my youngest in a stroller, I walked down the empty school hallway to where my son was hiding inside his locker, surrounded by 4 adults standing guard. The problem solved easily – the staff was understanding and supportive – and our principal unphased. However, the parents of my son’s classmates weren’t so easily reassured. After that incident, there were a number of parents who truly felt my son was a danger in the classroom, demanded that he be removed to an enclosed classroom environment, and even went so far as to call my house and insist I tell them my son’s full medical history. Although each of those problems was solved, one by one, I was left wishing I had an easy way to explain my son’s sensory differences to his classmates, their parents, and quiet honestly his teacher. I knew then that a book – a Children’s Book – with pictures and real information could make all of this much easier for my son and thousands of kids like him. So, I took it upon myself to write it. And with each page, each illustration and each step in the process, I kept close to my heart the desire to create a book that children with Sensory Processing Disorder would be proud to share with their friends and one that would empower them to become self-advocates. This is Gabriel Making Sense of School has already reached many children, but there are many more classrooms to reach! I am excited to say it will be re-released through Future Horizons Spring 2012 – spreading the message of SPD in the classroom even further! AW: What has been the most rewarding aspect of being special needs writer/advocate? HS: By far the best part of what I do is helping others. I have been passionate about sharing information and resources since my son was first diagnosed years ago. I believe that parents just starting out on their special needs journey – no matter what that is – should not be forced to forge their own path when there are so many of us who already know the way. Through my writing I am able to pass along what I have learned and help other parents avoid the pitfalls and emotional anguish that comes with blazing a new trail alone. The fact that other parents have responded positively to what I write has been rewarding and truly amazing. AW: What advice would you offer parents of recently diagnosed children? HS: Slow down. The newly diagnosed mentality is to strive for as much intervention, information, resources, therapy, and Google searching as humanly possible in the shortest amount of time possible. I know; I’ve been there. But we all get lost in that process – we lose ourselves, perspective on the rest of life, and often times damage our relationships with the ones we care the most about; our spouse and family. Yes our kids need help sooner rather than later, and I absolutely realize that most newly diagnosed parents have been on the ‘hunt’ for a diagnosis for some time and so there is that sense of relief that comes when they finally know which way to go, but many parents are treating the moment of receiving the diagnosis as if it were the starting gun in a race. I think parents fail to realize this is a marathon – you can’t leave the gate sprinting full speed ahead and expect to finish with any energy left. I know for sure that every special needs journey is different, every child’s optimal intervention unique, and therefore it takes time to get it right. So my best advice is slow down. Remember that no matter what label or acronym your child might receive, they are the same child inside with all of the same needs. Your child doesn’t just need a therapy-chauffer, medical-appointment-coordinator, play-therapy-director, or educational-advocate; they need you to continue to be mom and dad. Slow down. HS: When one door closes, another opens. I'm over at MommyMaestra today! Secretly, I'm Sort of Excited. A Few Hours "Without Men"